Ever since we moved into this house 2 years ago, the closets have been on my To-Do list. The problem is that something else always comes up. Lately I have been thinking that maybe if my kids' closets were more organized, their rooms would follow suit. I know it's wishful thinking, but it is worth a try! I guess to understand what I did I'll have to show you a before and after shot. Then I'll break it down for you. Her closet is a little strange. It has a window that makes the majority of one wall basically unusable. 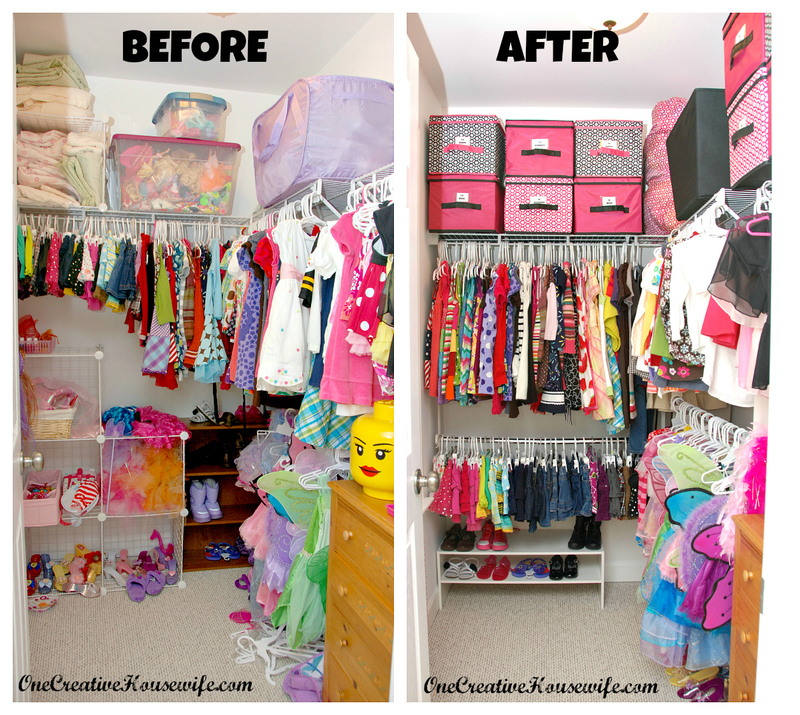 To begin, I removed everything from her closet, dusted the baseboards, and vacuumed. The first thing I put back in her closet was the small dresser. It is a dresser I had purchased at a yard sale, and refinished back in 2001 to take to college with me. I am debating painting it white, but I still kind of like it as is. The first drawer holds her plain headbands, and ponytail bands. The second drawer holds her Lalaloopsy's clothes. 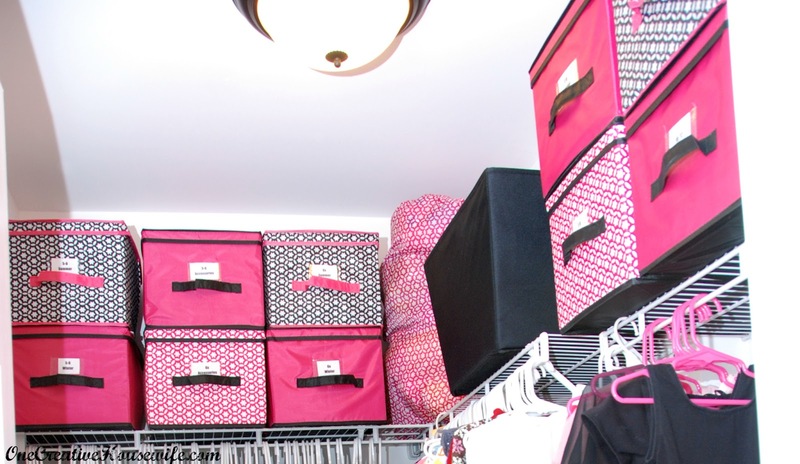 The third and fourth drawers hold some dress-up accessories. The bins on the dresser hold her play purses, and wigs. Above the bins, hang her dance outfits, and belts. 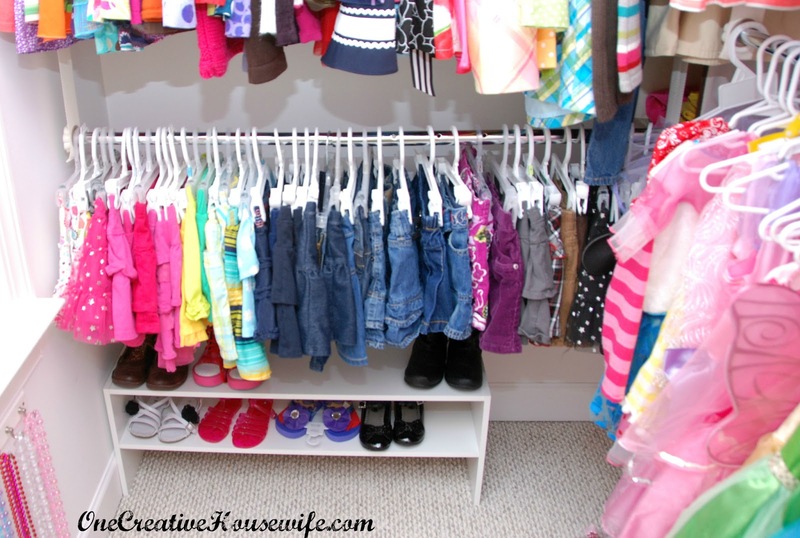 The gap in the middle is where I hang her outfits that we pick out ahead of time, to wear to school each week. 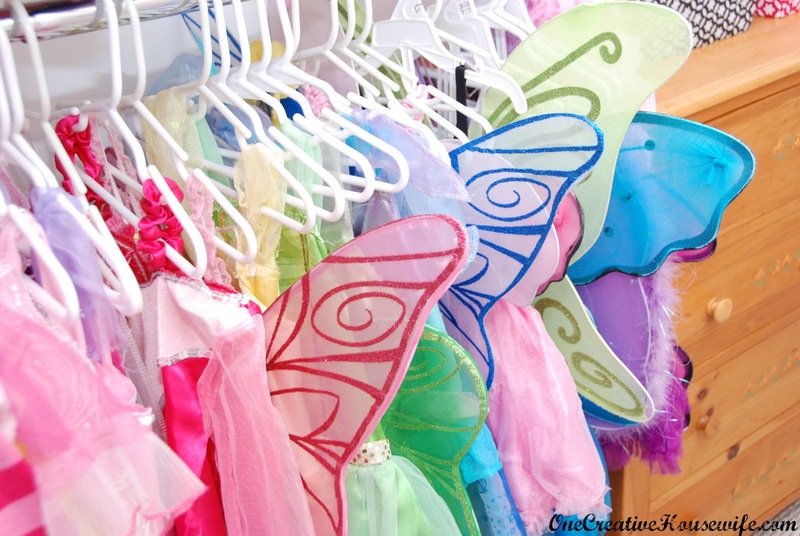 Next to the dresser hangs all of her dress-up costumes. They are on a closet doubler rod (Kind of like this one*, but I got mine at Target and it hangs on fabric straps.) I keep her dress-up shoes on the floor under the costumes. Along the back wall (on another closet doubler rod) I hung all of her skirts. I also added a shelf for her shoes. Pictured are her summer shoes, and shoes that are too big for her right now. The majority of her current shoes stay in our coat closet. To maximize the useable space in her closet, I added a fabric shelf to the back corner of her closet. It holds things like swimsuits, hats, winter accessories, etc. It is normally hidden by her dresses and shirts, but I removed some for the following picture. Along the top shelves of her closet I store clothing that I purchase for her that is still too big. The bins are labeled by size and season. The pink bag in the back corner, holds stuffed animals. The black bin holds extra backpacks and totes. 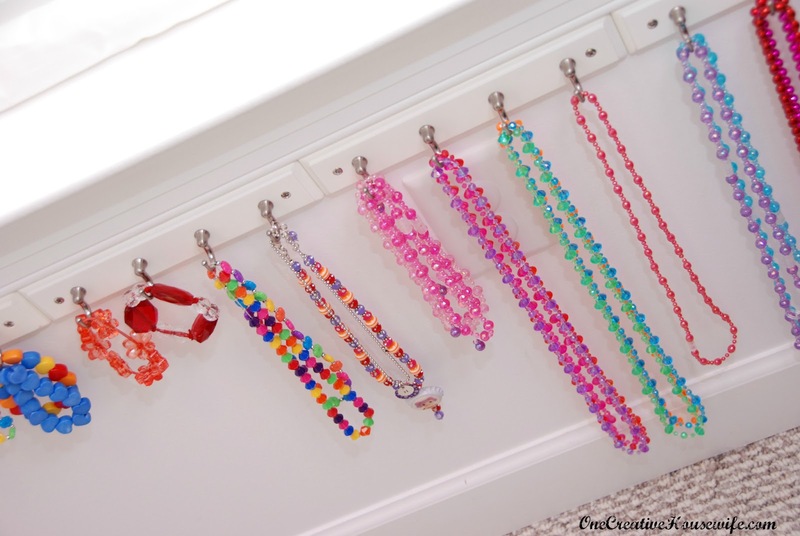 Under the window I hung key hooks to hold her jewelry. Behind the door I hung three memo boards that I had in my college apartment. They hold her hair barrettes. I also made a holder out of two ribbons, to hold her headbands with accessories on them. Watch for instructions on how to make your own in a future post! I hung a shoe organizer on the back of her door using 3M Command Strips, to hold her tights. I bet your asking yourself why I didn't just hang the shoe organizer over the door as it was intended to be hung. Well, I really hate it when the brackets that go over the top of the door, rub the paint on the door frame, so I decided I just wanted to avoid it. All of the pink and black bins/bags are from Target. The closet doubler rods are from Target. The key hooks are from Target. The shoe shelf is from Target. 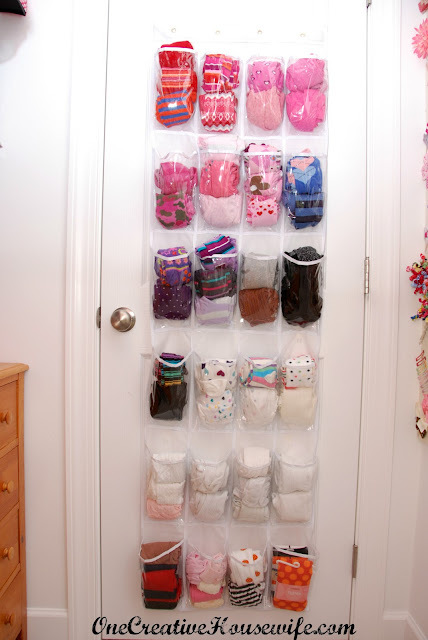 The clear shoe organizer is from Wal-Mart. So far the things I like best are not having to constantly untangle her necklaces, and being able to see all her tights, and hair accessories. It might not seem like much but it makes picking out outfits for the week so much easier. Thanks!!! and Thanks for the invite, I linked up! Wow! 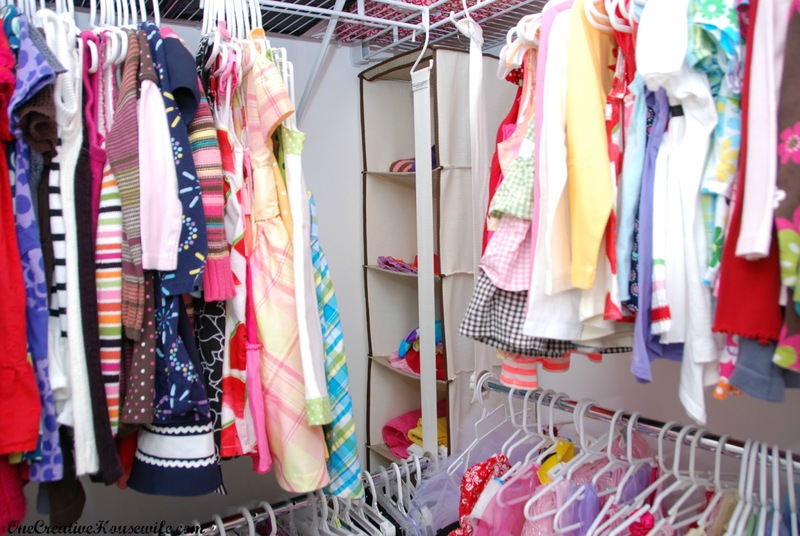 Your daughter sure does have a lot of clothes! How nice they all look so organized!! You did a wonderful job...thanks for sharing. found you through Rainbows and Honeysuckle Link Party and following you now!! LOL! She does have a lot of clothes. Thanks for the follow! Thank for the follow! I use 3M strips for so many things. Whenever they are on sale I stock up!!! This is amazing and very useful! You have inspired me to organize my daughter's clothes. Thank you so much for these ideas!! I found them on an endcap at my Target. They were at the end of the isle with the hangers in it. Did you post a tutorial for the ribbon headband holder? 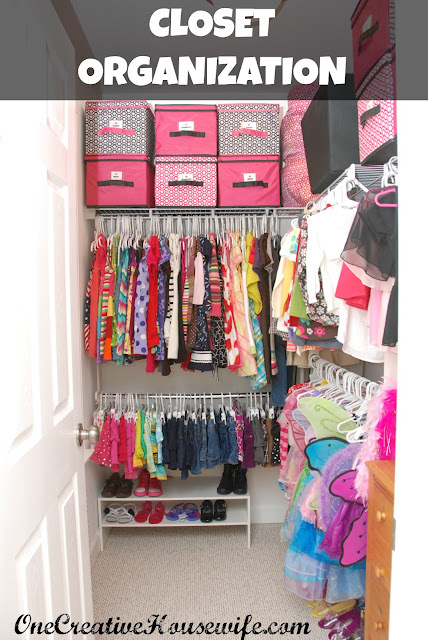 I want a closet like this for myself!!! !